Iceland is playing a growing role in China’s Arctic strategy. China’s efforts in recent years to increase its presence in the Arctic can now be considered to have been a success. Until 2014, observers were surprised by the activities of Chinese diplomats, executives, and scientists in the region, and even debated “China’s threat” in the Arctic. These days, though, China is seen as an essential actor that provides strong links for the region and drives economic development. China’s achievement of observer status in the Arctic Council (AC) in 2013 symbolized an unspoken acceptance of Beijing’s Arctic expansion. At the same time, bilateral relationship building with each AC member has enabled China to begin its work solving economic issues in regional policy. Of strategic importance for China’s plan is Iceland. The development and strengthening of Beijing’s ties with Reykjavik should be understood in the context of Iceland’s role as a player with influence in the region’s institutional transformation. This is demonstrated by the recent successes of Icelandic authorities. In 2007, Danish Foreign Minister Per Stig Møller came up with the idea to solve Arctic problems via the small “Arctic Five,” which included the U.S., Russia, Canada, Denmark and Norway. Iceland, which had not been invited to join, complained about the meetings and claimed that any decisions made without Reykjavik, Helsinki and Stockholm would not have validity. The protests paid off: The “Arctic Five” held only two meetings, in 2008 and 2010. After that, the decision-making process returned to the AC. Conscious of the need for more trenchant policy, in 2011 Iceland initiated discussions on cooperation agreements in aeronautical and maritime search and rescue in the Arctic. It also lobbied to create a permanent AC secretariat in Tromsø, where the experienced state official Magnús Jóhannesson, from the Icelandic Ministry for the Environment and Natural Resources, was appointed as a director. In 2013, Iceland raised its status in Arctic policy debates by hosting the Arctic Circle international conference, during which special attention was given to Asia-Pacific actors: China, India, South Korea and Singapore. The success of the conference helped Reykjavik establish itself as a center for opinion exchange regarding essential questions about economic, social and ecological Arctic development. Moreover, Iceland increased its authority in the region by winning the right to hold the Arctic Circle conference up to 2017. Finally, Iceland participated in a working group (Task Force to Facilitate the Circumpolar Business Forum) together with Russia, Canada and Finland in planning and establishing the Arctic Economic Council (AEC). The AEC, incidentally, could become a platform for Chinese investment in the region, changing Beijing’s status from an outside actor to a leading non-regional investor. Since China is not represented in the AEC as an equitable member, partner relations with Reykjavik could serve to facilitate the PRC’s foreign ambitions. Apart from Iceland’s merits as an effective facilitator, rapprochement between Beijing and Reykjavik is determined by the complicated relationship between Iceland and the EU. The negotiations for Iceland’s accession to the EU were not exactly crowned with success as the parties could not agree on a fish catch quota. Despite some comprises from Reykjavik, Brussels took a hard line. The fishing industry accounts for more than 10 percent of Iceland’s GDP, and a decrease in catches would be devastating. As a result, Iceland halted the talks (and temporally withdraw its application). It then began to search for an alternative source of investment to kick-start an economy that had been hard hit by the 2008-2009. Beijing took advantage of the tensions between Reykjavik and Brussels and offered a currency swap amounting to 406 million dollars, symbolizing the beginning of active collaborations with the Arctic state. China subsequently expanded its local embassy staff to eight people. The growing contact between the countries was capped by a visit from Wen Jiabao, then premier of the State Council, in April 2012 and the signing of a document pack defining bilateral cooperation. A free trade agreement in 2013 made Iceland a guide for Chinese interests in the Arctic and put the EU on the backburner. The foundation of the China-Nordic Arctic Cooperation Symposium, which became the second international scientific conference in which China has full membership, sealed the relationship. It is worth noting that the Chinese side is represented by five academic centers. China-Iceland cooperation has enabled Beijing’s officials and Arctic scientists to effortlessly attend and organize international symposiums to demonstrate their awareness of future regional development, while Reykjavik now has an economic partnership with the world’s second-largest economy. Iceland’s economic prosperity is based on three main sectors: fish catching and processing, aluminum and ferrosilicium production, and the use of geothermal energy for heating and electricity. Beijing evaluated the economic utility of these segments and proceeded to try and establish cooperation with an eye to the financial and technological benefits. Beijing’s interest in the industrial application of geothermal energy is part of its strategy for improving the environmental situation in the PRC. The use of coal as the main fuel for industry and residential heating has led to widespread air pollution and triggered ecological issues with a range of questions about priorities in the present five-year plan. At the end of 2015, clean energy should be meeting 11.4 percent of China’s energy needs, and by 2020, 15 percent. In contrast to the market for wind and solar energy, where Beijing has been investing heavily since 2003 and 2011, respectively, the development of geothermal energy was never a possibility until Wen Jiabao visited Reykjavik. The pilot project using Icelandic know-how in China was launched in Xianyang City, in Shaanxi province in 2006. The original plan was for heat and electricity for 1 million square meters of living space. However, this year the overall residential area under geothermal power will exceed 30 million square meters, and it will reach 100 million in 2020. This will make Xianyang the most ecological city in the PRC. It has been decided to repeat the project’s success in the provinces of Hebei (Baoding City), Shandong, Sichuan, and Yunnan, as well as in Tibet and Xinjiang. By the end of 2014, 85 percent of all residential space in Baoding (1.6 million square meters) was being heated by geothermal energy, saving 120,000 tons of coal. Moreover, local household heating expenses decreased to 15-18 yuan per square meter, down from 24 yuan when coal was the main source of heat. To advance China’s geothermal program, the leading Icelandic company Orka Energy worked with Sinopec to develop the joint venture Shaanxi Green Energy Geothermal Development (SGE), 51 percent of which is owned by the Chinese side. At the same time the Sinopec subsidiary Star Petroleum Co. signed an agreement with another Icelandic company, Geysir Green Energy. According to data from the PRC’s Ministry of Land and Resources, there are 12 geothermal sites in China with a cumulative energy potential equivalent to 853 billion tons of coal combustion. By comparison, China annually uses more than 3.5 billion tons of coal for industrial and residential use. However, the impact of geothermal energy production on the PRC’s energy balance is relatively small and will not bring major changes anytime soon because, while the joint Iceland-China test projects have been successful, further study of local Chinese peculiarities are needed. Nevertheless, taking into account the high concentration of high-temperature geothermal sources at the junction of the tectonic plates in Tibet, Yunnan and Sichuan provinces, Beijing will foster efforts to develop geothermal energy clusters exactly in these regions to smooth over the lack of electricity output and to solve the critical problem of grid modernization. 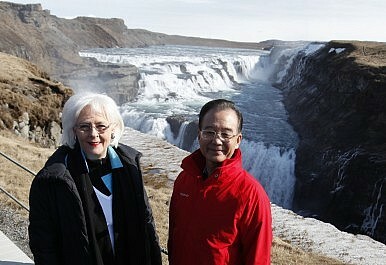 China-Iceland cooperation for geothermal energy clusters is a mutually advantageous process. Reykjavik provides technology and highly experienced specialists in well-drilling, research, and technical support. Moreover, each year Iceland hosts young researchers from the PRC for advanced training in the spheres of environmental sciences, geothermal utilization, and reservoir engineering as a part of a six-month UN University geothermal training program. In return, Reykjavik gains access to an enormous market estimated to be worth 70 billion yuan ($11.3 billion), according to analyses by the Xinhua News Agency. Combining Iceland’s technological experience and reputation with Chinese investment, we can assume that cooperation between two states has all the components to be repeated outside the PRC. For example, Beijing holds strong positions in Africa and Pacific Island states with abundant undeveloped geothermal potential. In 2013, Iceland exported about 786,000 tons of seafood for 1.9 billion euro, accounting for 45 percent of its commodity exports that year. Of this, China accounted for just 1 percent, or 40 million euro. In the wake of the free trade agreement, this situation will very likely change. One of the big Iceland banks, Íslandsbanki, predicts that by 2022 changing Chinese diets will see fish consumption rising to 20.6 kg per person a year. There are other factors for close Beijing-Reykjavik relations in fisheries. First, the Icelandic fishing industry has demonstrated stable annual growth rate of 10-15 percent since the 2008-2009 crisis. This means not only a growing catch and its direct export, but also an expansion of complementary manufacturing: fish processing. Iceland is a world leader in the full utilization of fish for food, feed (fishmeal is a strategic, high-priced asset), medicine, and technical uses. The current processing capacity in Iceland is limited and Reykjavik is considering a partial shift of production to China. Second, the issue of industry development is inextricably intertwined with modernization and a fishing fleet upgrade. The average age of Icelandic fishing vessels is 25 years. Issues of financing and new trawler purchases have at various times been on the agenda. Today, Icelandic authorities are contemplating the possibility of launching 11 new vessels at a cost 2 billion euro. However, the large debts of fishing companies, around 25 billion euros, could derail this plan without a Chinese interest in investing. The third component of potential cooperation is aquaculture development, an area of focus for both Beijing and Reykjavik. Recently, China has faced significant challenges in artificial fish breeding: Last year, the number of fish farms plunged by 30 percent and another 20 percent were considered overexploited. The causes of these negative statistics were environmental pollution and uncontrolled catching. On the other hand, Iceland has demonstrated annual growth in local farm production. Within the last two years it has doubled the number of farmed fish to 14,000 tons. Chinese investment would enable Reykjavik to increase output and boost its competitive position. For reference, active fish farming in Norway enabled Oslo to produce 1.5 million tons of fish annually. Finally, the academic potential of Iceland should not be overlooked. The United Nations University Fisheries Training Programme has already offered 19 PRC citizens advanced training in sustainable aquaculture, fishery planning and management under the guidance of Icelandic specialists. At present, the largest Chinese investment in Iceland is the Chinese National Bluestar Group’s purchase of the Norwegian firm Elkem, which owns a ferrosilicium plant in Grundartangi. Ferrosilicium is an essential element in the mass production of solar cells and it made the purchase because it strengthens the PRC’s dominance in this segment, providing additional benefits at a time of solar cell trade disputes with the U.S. and EU. Moreover, Beijing’s interest in Arctic development can be associated with two questions: Who will gain access to regional mineral resources and how will melting ice impact commercial shipping through Northern routes from Asia to Europe and back? Iceland has two potential oil and gas shelf sites: Dreki and Gammur. Dreki is operated by a joint venture of CNOOC, Eykon Energy and Petoro Iceland, in which the Chinese side has a 60 percent share. A strategic environmental assessment of Gammur is still pending approval, so no licenses have been granted. However, it is evident that Chinese oil giants will participate in development bids. Commercial shipping through Northern routes offers a broad perspective on the cooperation between Chinese COSCO and Icelandic Nesskip in the segment of container carriage, implementation of energy saving solutions, and reduction of CO2 emissions. In 2006, MOFA Iceland issued a preliminary plan for the development of a logistics hub that would be a transit port between Asia and Europe. Document authors suggested three possible locations: Eyjafjörður, Hvalfjörður and Reyðarfjörður. It is obvious that the completion of such a large logistics project would place a great burden on Iceland’s budget and would require outside investment from China, not the EU, given the political tensions between Brussels and Reykjavik. Incidentally, Iceland’s commitment to turning the country into the logistics hub of the Northern Sea Route is visible in Reykjavik’s consultations with Germany’s big engineering company Bremenports regarding the possible construction of port in Finnafjordur. Should there be an increase in the transit traffic of Chinese companies through the Northern Sea Route in the near future, the ambitious plans of an Icelandic hub may become a reality, and nobody will be able to question the PRC’s presence in the Arctic region. Arthur Guschin is a non-resident senior analyst at S. Rajaratnam School of International Studies (RSIS).